Shaw and Coulter discuss officiating in 1981. HOOVER, Ala. – In the fall of 1981, I was a senior in college juggling a full course schedule and full time TV job. Refereeing Football 110 sounded like a class that would benefit a budding young sportscaster and hopefully two hours easy credit. Part of our field training required officiating fraternity and sorority flag football. Fortunately, I had a major influence from a fellow named Steve Shaw (yes, that Steve Shaw), the Director of Football Officiating for the SEC. Shaw and Coulter discuss officiating in 2017. 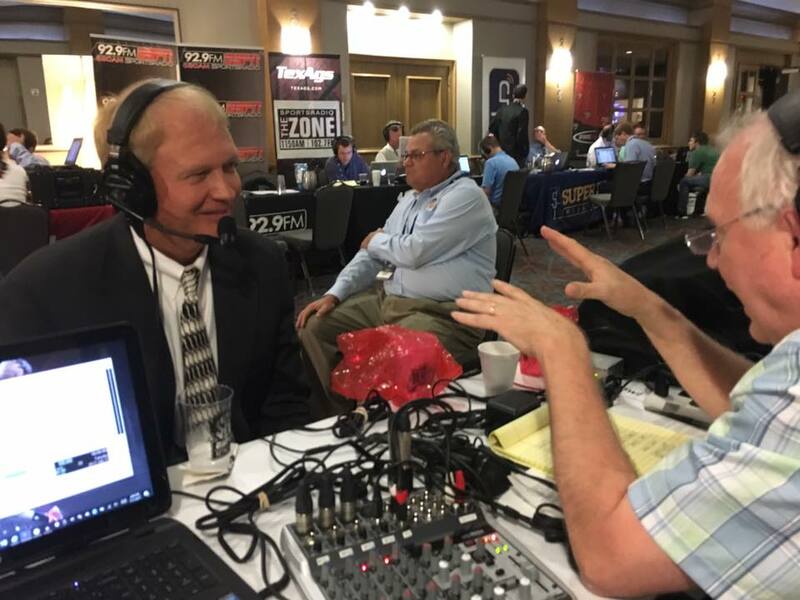 “Matt Coulter was the best football official in the history of Alabama intramural football,” Shaw said in jest in an interview on Yea!106.5 and 105.1 WRFS Tuesday afternoon. Fact is, I was struggling until he told me, “Stop listening to the sideline whining and call what you see. Don’t develop rabbit ears, trust your knowledge.” Not surprising that Shaw now oversees the most proficient referees in the most powerful athletic conference on earth. So much so that the NCAA recently named Shaw secretary-rules editor. “I’m humbled. I’m honored by that. I’ve always been a student of our rules. I have a strong passion for our rules and obviously our game. And I think our game is in great shape today. But the challenges we face today are very, very different than we’ve ever faced before. The game has never been safer,” said Shaw. It has also never been faster, stronger and…more emotional, especially with head coaches. Therefore, an old rule will be strictly enforced in 2017: “If a coach comes out onto the field of play, in the green grass, and protests an officiating decision, it’s an automatic unsportsmanlike conduct foul,” Shaw informed, stating two of the offenses in a single game will send the coach to the locker room. Who do you think will be the first SEC coach to get flagged for the infraction? It just might be a former Gator and current Gamecock. While that is a guess, one thing is not: football officiating in the SEC, and now the NCAA, is in extremely skilled hands. If you don’t believe me, ask the Delta Chi’s. Matt Coulter for SylacaugaNews.com | © 2017, SylacaugaNews.com/Marble City Media LLC. All Rights Reserved.